Between 2009 and 2012 the submarine was involved in both sea trial and test-firing of the Bulava missile. 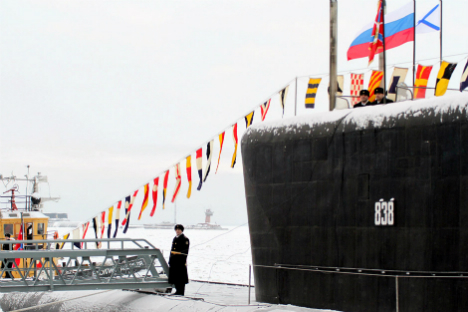 After years of sea trials and missile test launches, the Borei class nuclear-powered submarine Yury Dolgoruky has officially became part of the Russian Navy. The sub and its siblings are to be part of Russia’s nuclear deterrence shield. The official ceremony of raising the Russian Navy colours on the submarine on Thursday was led by Russian Defence Minister Sergey Shoigu. The Yury Dolgoruky is the lead vessel of the Borei family, the most modern nuclear-powered strategic submarines made in Russia. The submarine was commissioned in 1996 at a shipyard in Severodvinsk. It endured several years of budget restraints and design changes, after the intercontinental ballistic missile Bark, which was slated to become its prime armament, was scrapped. Its reactor was finally launched in 2008. Between 2009 and 2012 the submarine was involved in both sea trial and test-firing of the Bulava missile, which was the replacement for the Bark. It was expected to enter service back in 2011, but the deadline was eventually postponed by a year. In December 2012 the Navy officially accepted the submarine as ready to take combat missions. Russia has commissioned three submarines of the Borei class. Yury Dolgoruky’s sister boats, Aleksandr Nevsky and Vladimir Monomakh have been in construction since 2004 and 2006 respectively. Nevsky has been undergoing sea trials since October 2012 while Monomakh has been put on water in late December 2012. In May 2012 the Navy has also contracted development of an upgraded version of the Borei class submarine, which will carry 20 ICBMs, compared to the regular version’s 16. It will also have improved characteristics, such as reduced noise, better measurability and more advanced weapon controls. The keel of the lead advanced vessel, Knyaz Vladimir, was laid down in July 2012, with four more submarines expected to be built.